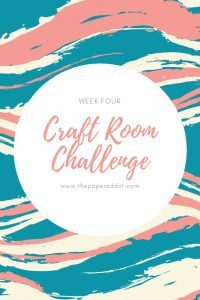 Good day everyone and welcome to week four of the craft room challenge! 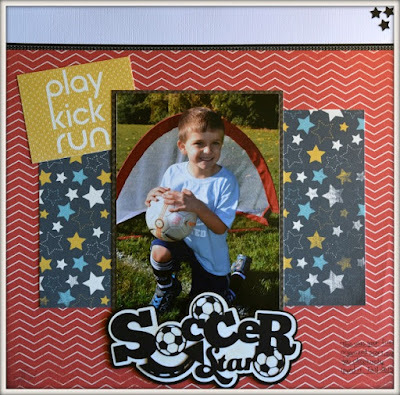 This week we were focusing on craft supply organization. This is my favorite part of clean up. 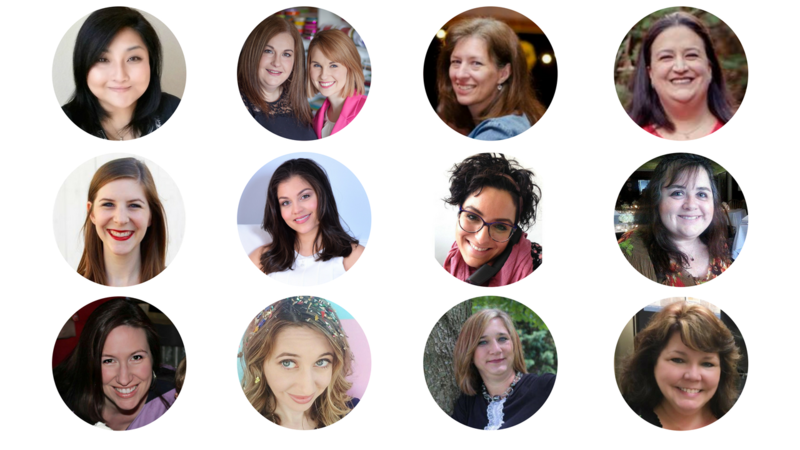 I LOVE to organize and I have several ideas to share with you that I think are just great! 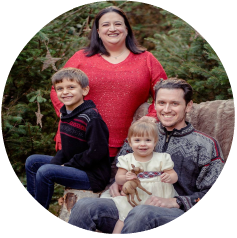 If you want to see where I started in this journey be sure to check out week one. The first thing I want to share with you is how I store my bling and most used tools. The bling includes, enamel dots, stickles, gems, single colored brads, etc. Each color (or color family if I don’t have many) gets their own white basket*. The baskets come in a set of three from Dollar Tree. so it is very affordable to separate them this way. When I want a certain accent piece I can now just pull out that color basket and everything is right there. I also placed some shelf liner* on the bottom of the drawer so nothing slides around. The tools are the ones that I used the most – think tape runner, sticker maker and tiny attacher. 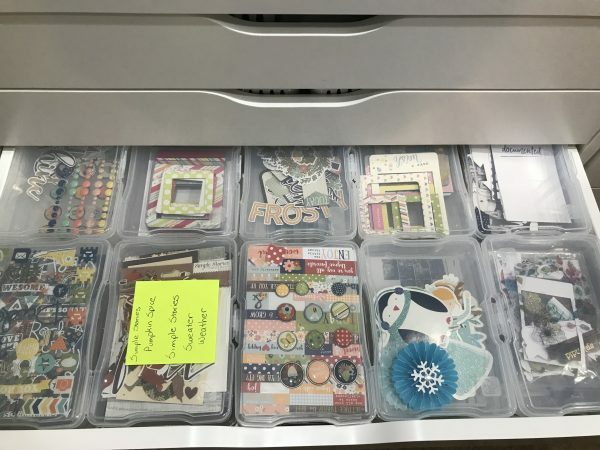 This is the top drawer of my Alex cube so it’s very accessible when I’m creating and easy for clean up after. 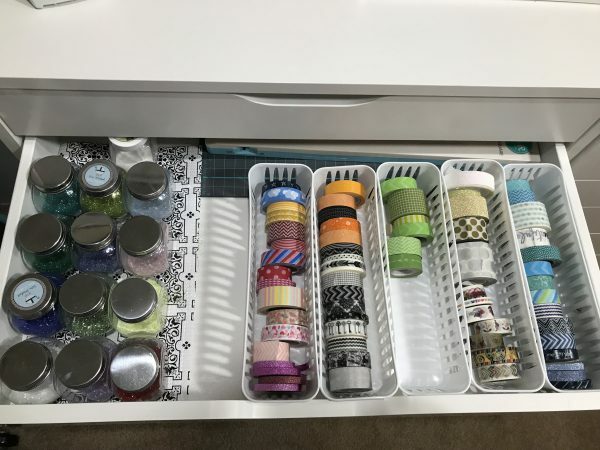 I store my washi tape and glitter. The storage is VERY similar to the bling, but I use long baskets again from Dollar Tree. 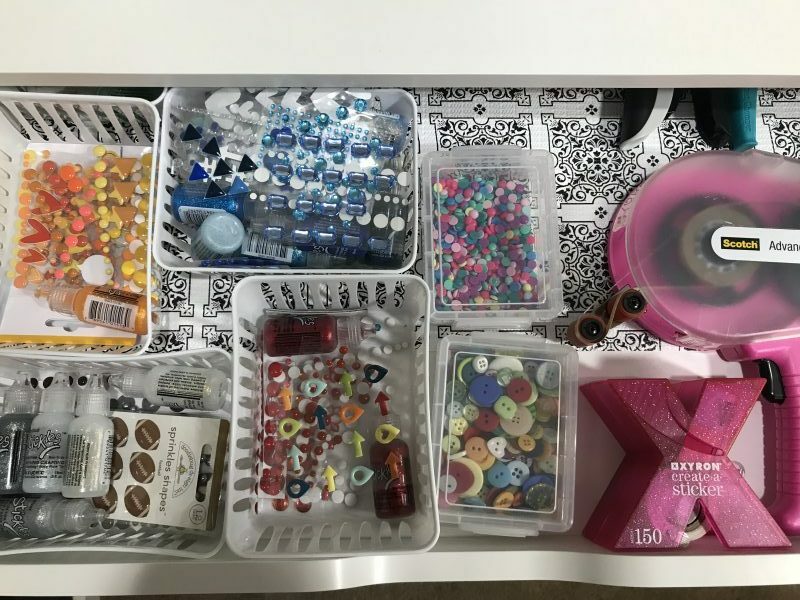 I attempt to keep them color organized, but this drawer is our 22 month olds favorite to play in. I figure if arranging washi keeps her entertained for 20 minutes it really doesn’t matter what order they are in! The glitter is in tiny bottles also from the dollar tree. I find these are perfect for putting a spoon in to scoop glitter out and the opening is large enough that pouring back in is easy. There’s less mess this way for me. This is one of my favorite storage tips. I bought a bunch of 4×6 plastic photo cases off eBay (it was the cheapest place at the time) and each collection gets its own case. If I have two collections of the same topic, and from the same company, they will go in the case together each in a zip top bag to save space. I am still toying with how I want to label these. I don’t really care for the post it note as it block me from seeing what’s in the case, but I don’t want a permanent level either since when a collection is done the case will be re-used. Any tips for me? I have been using this method for a long time, and it’s still working wonderfully for me. I hope those tips gave you some ideas, and now it’s one to week five! This week we are to clean and decorate…if that’s your thing. Vacuum that floor – dust the shelves and hang some things up that make you happy and inspire you to create. I can’t wait to share the reveal with you! 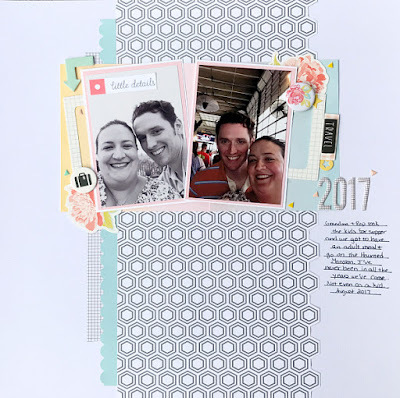 Thanks for joining me for another layout share! I’m thankful for all your views and comments. This layout was created with the free sketch that Scrapbook Generation put on their new Facebook challenge site. Be sure to look them up at SG Scrap Squad. I used at WRMK collection designed by Teresa Collins that I’ve had in my stash forever. 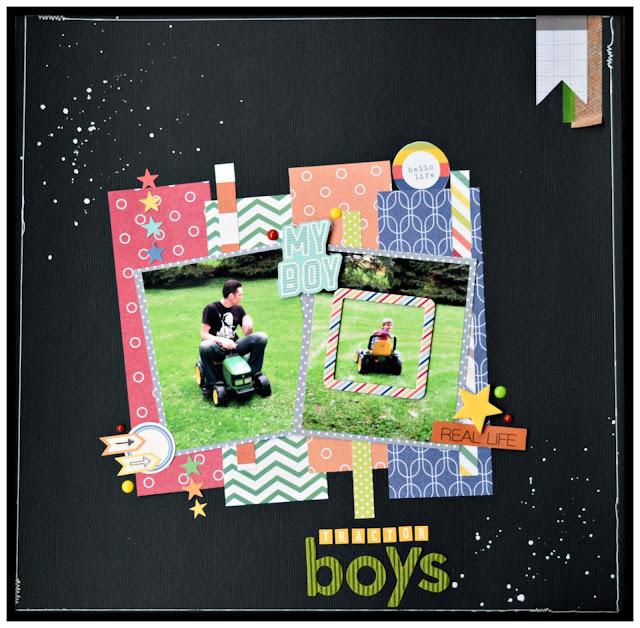 Some Freckled Fawn embellishments, doodling, Tim Holtz splatters and I was done. Easy peasy on this one and I was pleased with how the colors popped on black!